We asked Steve for a head shot. This is what we got! My name is Steve Duty and I’ve been obsessed with food my entire life. As a kid I lived in Japan, and my earliest food memory is being 9 years old and sitting on a bluff in a grove of bonsaied pine trees overlooking the Pacific as the sun set. I watched as all my Japanese friends opened their bento boxes and began eating their exotic meals. I had a deviled ham sandwich. But, that might’ve been the last one I ever had, because I realized then and there that there was a wide world of cuisine out there for the taking, and I wanted in. When I was a bit older we wound up in Seattle, and there I learned about the amazing cuisine of the Pacific Northwest and its incredible seafood and produce, all mixed with familiar Asian influences. I spent the next several years living in Belgium and France, and traveling through nearly every country in Europe. The European food culture was a revelation and a smorgasbord I dove into headfirst. It was the first time I realized there was an actual profession called ‘chef’, where you could be rewarded handsomely for your creativity and artistry. For the first time in my life I had a direction. After leaving Europe, I went straight to the Culinary Institute of America, and then on to get a degree at the University of Houston's Conrad Hilton School of Hotel and Restaurant Management. I have been in hospitality/food service management for my entire career, which has been long and varied. Prior to the CIA, I was a prep and line cook in many different restaurants, then made my living as a waiter for several years. While in school, I worked the line for Christian Delouvrier, one of Manhattan’s star chefs. Straight out of school, I ran an Officer’s Club for the Army in Berlin, Germany. It was a large and complex operation encompassing several restaurants, bars and convention facilities, but I always missed working the line. Next, I owned and operated a restaurant in my hometown, the tiny Ozark mountain town of Rogers, Arkansas. From there I moved to Washington DC, and a position managing a high volume restaurant for a national chain. I then opted to step out of the traditional food service world, and took a job opening up a winery, which gradually morphed into a head winemaker position. From there, I went back to school for cheesemaking, and opened up a sheep farm and dairy, along with a creamery for making farmstead sheep’s milk cheese. Along the way I also picked up another degree in brewing and fermentation. All through this time, I continued travelling the world and partaking of the local cuisine wherever I went: Peru, Mexico, Japan, Cambodia, Laos, Thailand, China, Singapore, Hong Kong, Taiwan, Malaysia, Turkey, Nepal, Bhutan, Europe, Abu Dhabi, Bahrain and the UAE, the Caribbean – they’ve all left a lasting impression on my cuisine-consciousness. Food has given me a lens through which to view these foreign cultures. By eating what they eat, learning to make it, and, most importantly, learning why they eat what they do, it has given me a better depth of understanding of all the peoples I’ve met. Whether it’s been eating schnitzel with slugs on a mountaintop in Austria on Christmas Eve, or sharing fried crickets with a Hmong tribe on the banks of the Mekong while their village got electricity for the very first time, every experience has left an indelible mark on me, and just made me hungry for more. Although I don’t actually work in the food biz anymore, I remain an avid home cook and entertainer. We regularly host dinner parties from four to 50, usually with a 'foreign country’ theme, so I’ve always got some new recipe or some new cocktail germinating in the back of my mind. And you can call me Steve. This is my take on Gai Yahng, or Thai-style grilled chicken. This simple, but fantastic dish can be found all over Thailand at roadside vendors along the highway and street stalls in every city. When we travel through Southeast Asia, nosing through the wet markets, visiting temples out in the countryside, or wandering down alleyways in search of the perfect souvenir, Gai Yahng is always around to make a quick and easy snack, and it's reliably delicious every time. While every cook in Thailand seems to have their own personal recipe for this dish, this is my version. Once you get the hang of it, feel free to tinker around with the basic proportions until you get to your own perfect blend. There are no wrong answers here – and that’s the beauty of it! The grilled chicken is typically pulled off the bone, placed into lettuce leaves with various fresh vegetables as garnish, dolloped with rice, rolled up, then dipped into a modestly spicy sweet and sour dipping sauce called Naam Jim Kai. I’ve also included a recipe for Nuoc Cham, the Vietnamese dipping sauce based on fresh lime juice and fish sauce. While not traditional, I think it goes wonderfully as a dipping sauce in addition to the Naam Jin Kai. Wash and pat dry chicken inside and out. Starting at neck end of chicken, use shears, a cleaver, or a chef’s knife to slice through the ribs and backbone all the way to the tail. Repeat on other side. Remove backbone, reserve for stock, along with wing tips. Turn chicken over, with breast facing up, and spread ribs. Press down on breast until the breastbone cracks. Lay chicken out flat. Process cilantro, soy sauce, oil, white pepper, garlic, salt, and chilies to a paste in food processor. Reserve ¼ of the paste. Spread ¾ of the paste over chicken and marinate in refrigerator overnight, or up to 24 hours – the flavor will just penetrate deeper the longer you marinate it. Heat one side of charcoal or gas grill to high. Leave other side off. Place chicken in grill basket, and place basket lid on chicken, securing so chicken lays flat. Alternatively, simply cut chicken into eight pieces and place on grill. Grill chicken over high heat 10 minutes per side, basting with reserved marinade every 5 minutes. Remove chicken to cooler side of grill, and finish cooking until thermometer inserted in thigh reads 165°F, approximately 15 minutes. Rest chicken five minutes. Meanwhile, prepare platter of lettuce leaves, mint, basil, cilantro, shiso leaves, chilies, and lime wedges. Prepare rice, and place into a serving bowl. Prepare small bowls of Naam Jim Kai, Nuoc Cham, and Dua Gop. To serve, cut chicken into pieces if grilled whole. Each guest removes chicken from bone, and places the chicken in a lettuce cup, adding garnishes of their choice, and some rice. 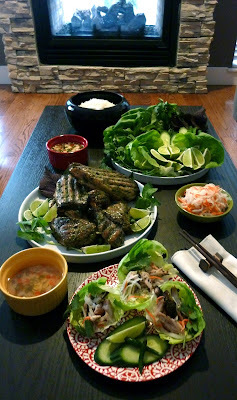 Fold lettuce into a roll, and dip into Naam Jim Kai or Nuoc Cham. Bring water, sugar, vinegar to boil. Lower to simmer and reduce by half. Remove from heat and cool. Stir in garlic and chilies. Allow flavors to meld for 15 minutes. Dissolve sugar in lime juice, vinegar, and fish sauce. Stir in chilies and garlic. Allow flavors to meld for 15 minutes.